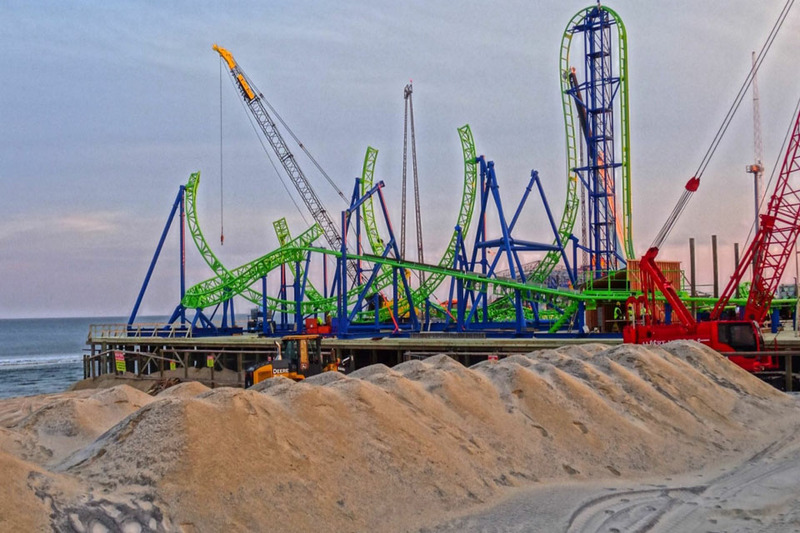 Crews continue to assemble a roller coaster on a recently expanded Jersey Shore boardwalk amusement pier that was badly damaged by Superstorm Sandy. Announced late last year, Casino Pier in Seaside Heights expects the ride to be operational by this spring on the newly expanded pier deck. A new ferris wheel will accompany the roller coaster. JSHN contributor Kevin Michelson captured the above image last week. The Gerstlauer Euro-Fighter roller coaster features a 72-foot vertical lift, vertical loop, and a turn and roll. The two eight-person cars track at 45 miles per hour along the 1,050-foot track. The Technical Park ferris wheel will peak at 131-feet and contain six passenger cars. The pier expansion, which started last September, is the result of a controversial land swap between the Casino Pier operator and Seaside Heights, resulting in shifting ownership of a 1.36-acre beach parcel from the borough to the pier. In exchange, Seaside Heights received a parking lot near the boardwalk to potentially house a beloved historic carousel for preservation. Beach access advocates lambasted the plan, saying it diminished the public's ability to access the beach, while proponents argued its necessity to spur tourism. Pier owners sought the beach expansion since extending the pier eastward over the ocean — where the Star Jet roller coaster fell into the water and became an international symbol of the superstorm — was too expensive and unrealistic. The land once occupied by Funtown Pier, located to the south in both Seaside Park and Seaside Heights, remains undeveloped after suffering damage by Sandy and then fully destroyed by the September 2013 boardwalk fire.